No matter how you feel about it you can’t deny the fact that this book strikes a genuine chord with people, one way or another. The book’s popularity certainly suggests that a large percentage of the public adores it and sings its praises to others. How else could you explain the fact that its worldwide sales hover somewhere around the 15 MILLION mark, according to Robert Munsch’s website? (15 MILLION!! Incredible!!) More than 7 million copies have been sold in the U.S. alone. 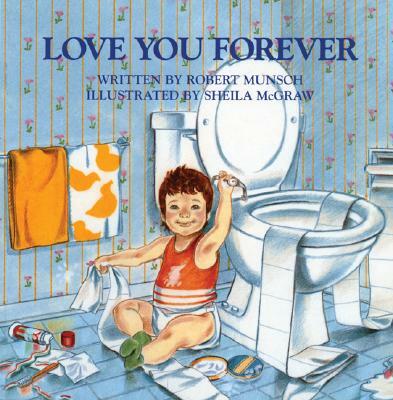 When PW compiled a list of the All-Time Bestselling Children’s Books in the U.S., Love You Forever was the fourth bestselling picture book in paperback. This entry was posted in Uncategorized on May 6, 2008 by Alison Morris. I believe this book was written by an adoptive parent. As an adoptee, my adoptive mother always read me this book. I never thought anything was wrong with the message or story until she bought it as a baby shower gift with the words written to my soon to be son saying “I love you forever my grand baby you’ll be”. It completely sat uneasy with me as an adult. When I reread the story after having my own son and understanding what unconditional love is, I realized I would NEVER violate my child the way this mother in the story does as the child is an adult. It doesn’t surprise me that the author is an adoptive parent. The book portrays the typical traits of being controlling, using a child as means to their own end, and viewing your adopted child as something that belongs to you instead of his or her own person. It’s unsurprising and sickening in so many ways. Here is how Love You Forever came into play. Quite sad and not creepy to me when you realize the reasoning behind it. I’m not a fan of the book, but apparently it speaks to millions. Who am I to deny the validity of their experience? I also didn’t get into Harry Potter or Twilight. But their popularity doesn’t bother me. No book is for everyone. No book is for no one. A little creativity can find uplifting or disturbing messages in any book. it’s funny that people get so riled up about this book. as a child that had it read to me many times, i can say that all it expresses is the undying love that a mother has for their child. a positive message and nothing more. Believe it or not, I asked the minister to read “Love You Forever” at my mom’s funeral. The book represents a love that never dies to me. Then again, I enjoyed “Velveteen Rabbit”, too. If you have ever seen Robert Munsch perform the story you’ll laugh. I’m not sure if he meant it to be ridiculous but I think he did. The way he tells it, it is nutty and laughable…in a GOOD way. but yeah, the illustrations eek me out. Not a fan of the pics. An early commenter is correct. Bob Munsch wrote this book after his first two infants were stillborn and he realized that he would never see them grow up. The idea of being able to watch his children grow, the longing to have the ability to be with them at all times was seductive for someone who put two infants in the ground. This, to me, makes the book make perfect sense. I don’t personally love the book, but I read it as a poignant sense of loss and desire to see, touch, know the children who are now unknowable. Hated “Love You Forever”. I don’t find it funny, and I have a seriously dry wit. The love book I read to my daughter is “Guess How Much I Love You”. To the Moon and back! It’s sweet and it’s fun to read, and there isn’t a bit of creepy about it. i reamember when my teacher read this book to me and i touched my sooo much i read this book to my students and when i saw this add i imediatly stared to sing the song thats in this book!!! best children/parent book ever!!! Someone gave us Love You Forever and Good Night Moon when my oldest daughter was born. Hated both on first reading – what weird books. Then I read them again. And again. Now I love Good Night Moon – such lovely use of language to soothe and calm and get ready for sleep. And then I read more Munsch books and learned the man has a very weird sense of humor – but I like it. To me the book is obviously satire – but with an underlying message about the cycle of life that is genuinely touching. Illustrations are terrible – ugly and sentimental. I’m not allowed to read this book to the kids when my husband’s around though – *he* cries – and he is not a sentimental man. Rainbow Fish – now that book creeps me out – no satire there. Love it! The beauty of stories is that they can be interpreted by the reader any way they want and aren’t necessarily literally. Do you also take Goldilocks and the 3 Bears literally? If you don’t have an imagination then maybe you shouldn’t be reading children stories to begin with. My son laughed at the thought of his mother climbing through a window to hug him and he laughed at me for crying while reading him a story. Anyone else dislike Velveteen Rabbit? Your best friend sticks with you through a terrible illness, then gets thrown away? What, they couldn’t have boiled it and given it back to the kid? I absolutely hate this book — it’s creepy. I think that what is wrong with families today is that there isn’t enough closeness and that’s why so many of you do not like this book. It’s probably too much for you because you are emotionally closed off. I am close with my parents, and son, and nieces, and brothers, etc. and I GET it. Most children’s books are about sparking your imagination anyway-sheeeeeeese. Lighten up. This book is creepy because the mother WON’T LET GO. It reminds me of how creepy The Runaway Bunny is – when I read that book as a kid, I just felt suffocated. Almost like my mother was never going to let me grow up and go out on my own. And I don’t even have that kind of a mother. It’s a book people. Written by a man who masters basic children’s stories. Whether it speaks to adults or children, stop trying to find hidden meanings and enjoy spending time with your kids just reading. Why does this have to be an issue about creepiness? How in the world is it creepy? You find it creepy ’cause a mother loves her son and breaks into his house at night to hold him? So what if it’s not “realistic” it’s a CHILDREN’S STORY…geez. It’s just supposed to be fun. ugh. I am a mother of two and absolutely love the book! When I would try to read it to my now 8 yr old when he was two well he would just hit at it and such. However he reads it to me now and laughs when I cry at it!!!!! So late to this party but I can’t resist adding my two cents. “Love You Forever”, “The Giving Tree” “Rainbow Fish” and all those other books that preach the virtues of bizarre dependency on the part of the child and selflessness verging on self-abnegation on the part of the mother simply reflect the fact that emotionally stunted people write emotionally stunted books, then pitch them to emotionally stunted editors who love them and help them find their market of emotionally stunted readers. This is, apparently, a vast market. But y’all knew that because Oprah and titles in the self-help genre reign supreme year after year after year. Read Alice Miller’s “The Drama of the Gifted Child” and you’ll get an interesting perspective on why people have such bizarre notions of what a good parent is.